This is the first of what was originally a two part piece that has now expanded into three. 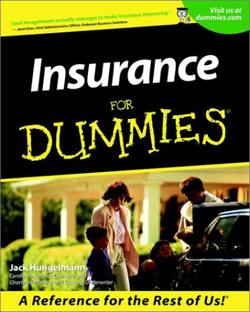 In the initial chapter, I provide some background on Insurance industry concepts and practices. These are built on in the second chapter (Using historical data to justify BI investments – Part II), in which I offer an Insurance-based worked example. In the final piece, which is cunningly named Part III, I will explain how such an approach to analysing historical data can be used to justify BI investments. Readers who are already au fait with insurance may choose to wait for the next instalment. Quite some time ago, when I wrote Measuring the Benefits of Business Intelligence, I mentioned that, in some circumstances, I had been able to leverage historical data (is there any other kind?) to justify Business Intelligence investments. I briefly touched on this area in my recent interview with Microsoft’s Bruno Aziza (@brunoaziza) and thought that it was well past time me writing more fully on the topic. My general approach applies where there are periodic decisions to be made about a business relationship and where how that relationship has performed in the past informs these decisions. These criteria particularly pertain to the industry in which I ran my first BI / DW project; commercial property and casualty insurance. While I hope that users from other sectors may be able to extrapolate my example to apply to them, it is to insurance that I will turn to explain what I did. My previous article, The Specific Benefits of Business Intelligence in Insurance, starts with a widely used and pig-related (no typo) explanation of how insurance works, both for the insurer and the insured. I won’t repeat this here, but if you are unfamiliar with the area I recommend you taking a look first. Although of course there are exceptions (event related insurance for example), many commercial insurance policies – just like those that most of us purchase in our personal lives to cover cars and property – have an annual term after which either party can decide whether or not to renew the cover. At renewal, as in the pig example, the insurer will first of all want to assess whether or not they have received more money than they have paid out over the past year. However, the entire point of insurance is that sometimes an event occurs which requires the insurer to give the insured a sum in excess of the premium that they have paid in a given year (or indeed over many years). The insurer is therefore less interested in whether a particular year has been bad – from their perspective – than whether the overall relationship has been, or will become, bad. Perhaps I am over simplifying, but if in most years the insurer pays out less in settling claims than they receive in premium (or ideally there are no claims at all) and if one bad year’s claims are unlikely to negate the benefits accrued in the normal years, then this is good business for the insurer. I have bandied about a number of rather woolly concepts in the previous section which include: how much money the insured has paid out and how much they have taken in. Of course these things tend to be more complicated. On the simpler side of the equation, broadly speaking, money coming in is from the insurance premiums paid by customers (but see also the box appearing below). Some insurers are actually relatively relaxed about paying out more in claims that they receive in premium over the life of a policy. This is because of timing differences. So long as the claims are settled some time after premium is received and so long as there are relatively lucrative investment opportunities (remember that? ), it may be that the investment income that the insurer can generate while it has use of the insured’s premium will more than compensate for what might be termed an operating loss on the policy. Equally some insurers will have the business goal of – at least in aggregate – always having premiums exceeding claims and thus making a profit on their core underwriting activities. In this case any investment income is added to the underwriting-related profits, rather than compensating for underwriting-related losses. I won’t complicate this article any further by including investment income, but it is a factor in the profitability of insurance companies. In the cause of clarity, I will lump commission, reinsurance and the general expense of being in business into Other Expenses for what follows. However please bear in mind that, as is often the case in life, things are not as simple as I will make them out to be. This concept requires a short diversion as later on I will exclude it from our discussions and will need to explain why. There are some interesting time lags in insurance. Take the sad case of asbestosis (also mentioned in my previous article). Here those unfortunately exposed developed symptoms of the disease in some cases many years later. However if their exposure was in say 1972, they would be covered by whatever Employers Liability policy their organisation held or whatever personal policy they held in the case of the self-employed. An asbestosis sufferer may have changed insurance company ten times since their exposure, but it is the insurance company who provided cover at the time who is liable for any claims. Rather than waiting for such claims to emerge, insurance companies follow the best practise of recognising liabilities at the earliest point. Because of this, they set up estimated reserves for claims that they may receive in future years (or decades) and apply these to the year in which the policy was in force. Of course in some lines of business, say Property cover, most claims are reported as soon as they occur and so IBNR reserves are low. However in others, say Directors and Officers Liability, or the Employers Liability mentioned above, claims may arise many years hence and IBNR can be a big factor in results. It should be stressed that IBNR is seldom calculated for a single policy (though it is conceivable that this would happen on a very large risk). Instead it is estimated for classes of policies, often grouped into lines of business, and the same “rate” of IBNR is applied across the board. Of course IBNR is calculated based on experience of losses in the same baskets of policies in previous years, adjusted to take account of current differences (e.g. more or less favourable economic conditions for Directors and Officers Liability, or maybe rising or falling property indeces for Property). For reasons that are probably obvious, lines of business where most claims are promptly reported (i.e. low IBNR) are called short-tail lines. Those where claims may emerge some time after the period covered by the policy (i.e. high IBNR) are called long-tail lines. Later on I will be focussing just on short-tail business. Something else may have occurred to readers when considering the time lags that I reference in the previous section, namely that while a policy may last from say 1st January 2006 to 31st December 2006, claims against this may occur either during this period, or after it. The financial statements of an insurance company will place claims in the period that they are notified or settled. So in the above example, a claim paid on 23rd April 2008 (assuming the financial and calendar years coincide) will be reflected in the 2008 report and accounts. However it is often useful for analysis purposes to lump together all of the claims relating to a policy and associate these with the year in which it was written. Again in our example this would mean our 23rd April 2008 claim would be recorded in the Underwriting Year of 2006. So an Underwriting Year report comparing 2006 and 2007 say would have the premium for all policies written in 2006 and all the claims against these policies – regardless of when they occur – compared to the premium for 2007 and all the claims against these policies, whenever they occur. 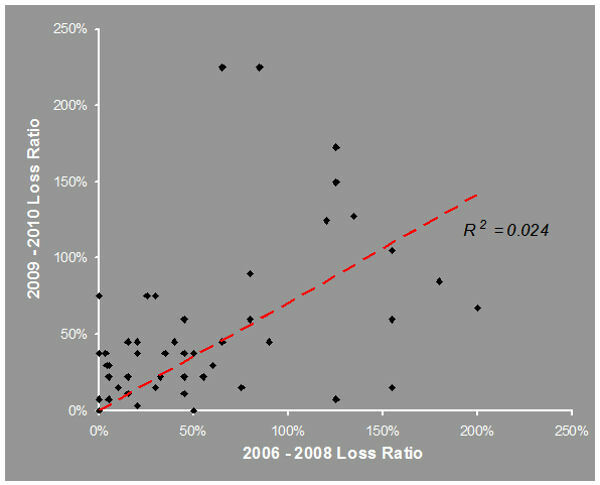 Because of this, Underwriting Year reports provide a good measure of the performance of policies (or books of business) over time, regardless of how associated losses are dispersed. By contrast Calendar Year (i.e. financial) reports will often have premium from policies written in say 2010 combined with losses from policies written in say 2000 – 2010. Having laid some foundations, in the next article, I will draw on the various concepts that I have introduced above to offer a worked example. 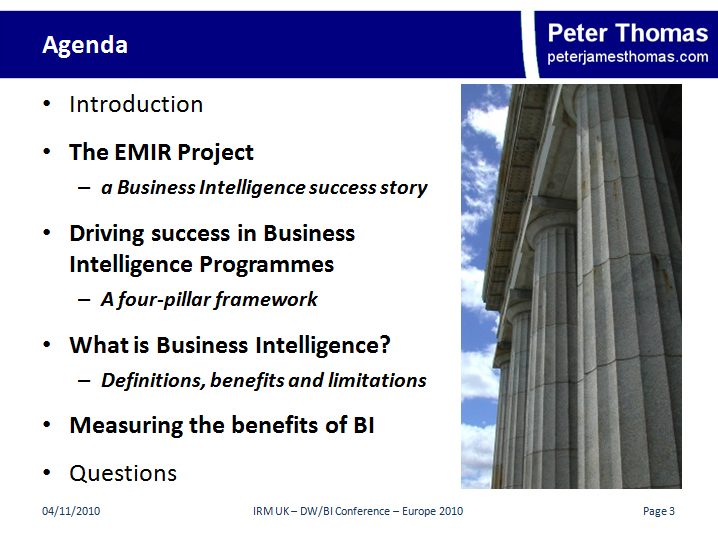 In the closing chapter, I will explain how I such an example to justify a major, multi-year Business Intelligence / Data Warehousing programme within the insurance industry. A friend and fellow information professional is currently responsible for both building a new data warehouse and supporting its predecessor, which is based on a different technology platform. In these times of ever-increasing focus on costs, she had been asked to port the old warehouse to the new platform, thereby avoiding some licensing payments. She asked me what I thought about this idea and we chatted for a while. For some reason, our conversation went off at a bit of a tangent and I started to tell her the story of an acquaintance of mine and his recent sad experiences. My acquaintance, let’s call him Jim to avoid causing any embarassment, had always been interested in cars; driving them, maintaining them, souping them up, endlessly reading car magazines and so on. His dream had always been to build his own car and his eye had always been on a Caterham kit. I suppose for him the pleasure of making a car was at least as great, if not more, as the pleasure of driving one. Jim saved his pennies and eventually got together enough cash to embark on his dream project. Having invested his money, he started to also invest his time and effort. However, after a few weeks of toil, he hit a snag. It was nothing to do with his slowly emerging Caterham, but to do with the more quotidian car he used for his daily commute to work. Its engine had developed a couple of niggles that had been resistant to his own attempts to fix them and he had reluctantly decided that it was in need of some new parts and quite expensive ones at that. Jim had already spent quite a bit of cash on the Caterham and more on some new tools that he needed to assemble it. The last thing he wanted to do now was to have a major outlay on his old car; particularly because, once the Caterham was finished, he had planned to trade it for its scrap-metal worth. This sounded like a great idea to Jim, but there were some issues with it. His Cateham was supplied with a Cosworth-developed 2.3-litre Ford Duratec engine. This four-cylinder twin cam unit was the wrong size and shape to fit into the cavity left by removing the worn-out engine from his commuting car. Well as I had mentioned at the start, Jim was a pretty competent amateur mechanic and he thought that he had a good chance of rising to the challenge. He was motivated by the thought of not having to shell out extra cash and in any case he loved tinkering with cars. So he put in some new brackets to hold the Caterham engine. He then had to grind-down a couple of protruding pieces of the Duratec block to gain the extra 5 mm necessary to squeeze it in. The fuel feeds were in the wrong place, but a bit of plumbing and that was also sorted. Perhaps this might cause an issue with efficiency of the engine burn cycle, but Jim figured that it would probably be OK. Next the vibration dampers were not really up to the job of dealing with the more powerful engine and neither was the exhaust system. No worries, thought Jim, a tap of a hammer here, a bend of a pipe here and he could also add in a couple of components that had been sitting at the back of his garage rusting for years as well. Eventually everything seemed fine. Jim ventured out of his garage in his old car, with its new engine. He was initially a bit trepidatious, but his work seemed to be hanging together. Sure the car was making a bit of a noise, shaking a bit and the oil temperature seems a bit high, but Jim felt that these were only minor problems. He told himself that all his handiwork had to do was to hang together for a few more months until he finished the rest of the Caterham. With these nice thoughts in mind, Jim approached a bend. The car flew off the road at a tangent as he realised – too late – that he had been travelling at Caterham speeds into the corner and didn’t have a Caterham chassis, a Caterham suspension, or Caterham brakes. His old car was not up to dealing with the forces created in the turn. His tyres failed to grip and, after what seemed like an eternity of slow-motion spinning and screeching and panic, he find himself in a ditch; healthy, but with a wheel sheared off and smoke coming out of the front of the car. A later inspection confirmed that his commuting car was a write-off, and his insurance policy didn’t fully cover the cost of a new vehicle. Jim ended up having to buy another day-to-day car, which delayed him from spending the additional money necessary to get the Caterham on the road for quite some time. However, after scrimping and saving for a while, he eventually got back to his dream project, only to find that combination of the modifications he had to make to the Duratec engine, plus the after effects of the crash meant that it was now useless and he needed to purchase a replacement. So because Jim didn’t want to run to the expense of maintaining his old car while he built his new one, he would instead have to buy a new temporary car plus a new engine for the Caterham. Jim was just as far off from finishing the Caterham as when he had started, despite wasting a lot of time and money along the way. A very sad story. Suddenly I realised that I had been wittering on about a wholly unrelated subject to my friend’s data warehousing problem. I apologised and turned the conversation back to this. To my astonishment, she told me that she had already made up her mind. I suppose she had taken advantage of the length of time I had spent telling Jim’s story to more profitably weigh the pros and cons of different approaches in her mind and thereby had reached her decision. Anyway, she thanked me for my help, I protested that I hadn’t really offered her any and we each went our separate ways. I found out later she had decided to pay the maintenance costs on the old data warehouse. I would like to apologise in advance if anyone at Caterham, Cosworth, Ford, or indeed Peugeot, takes offence to any of the content of the above story or its illustrations. I’m sure that you make very fine products and this article isn’t really about any of them.